Hey there! 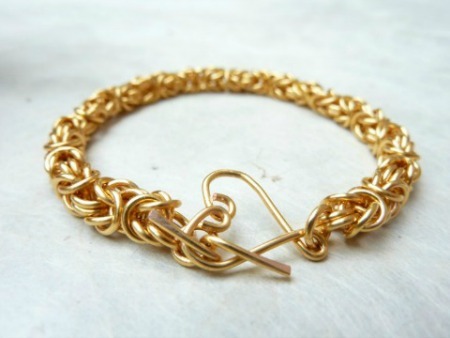 My name is Bev Feldman, and I am the owner/designer of Linkouture, modern handcrafted chainmaille jewelry for women. I recently became a member of Boston Handmade, and I am thrilled to be here and give you a little glimpse into my inner workings! A: I grew up in the fine state of New Jersey and moved to Boston in 2004 after graduating from college. I wasn’t sure what I wanted to do with my life, I just knew it involved working with children. Several jobs and a master’s degree in education later, I got married and left my job to travel around South America with my husband for five months at the beginning of 2012. When I returned, instead of pursuing a job in the field, I decided to focus on my jewelry business which I had started right before I went abroad (naturally). Q: What is the first thing you can remember making by hand? A: The first thing that I clearly remember making was when I took a pottery class was I was six years old. The two things I most remember making were a pizza slice that sat on my father’s work desk for years, and a ceramic bust that was supposed to be me (it was an assignment, I don’t think 6-year-old me would have ever come up with that idea on her own). It didn’t really look like me, especially since I decided to give myself bangs even though I didn’t have any at the time. I did manage, however, to convince my little sister for years that it was my old head! Q: What handmade possession do you most cherish? A: I would have to say a needlepoint hanging my mom made for me for my Bat Mitzvah. I remember her carrying it around with her wherever she went, adding in stitches when she had a spare moment. She spent so long working on it, and even at that age I could tell how much love and energy she put into making it. Q: What do you love most about what you make? A: I love the process of making chains. 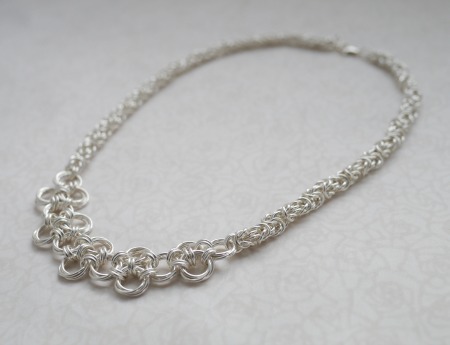 I could seriously just get lost in making chainmaille for hours (or at least until my hands cramp up!). 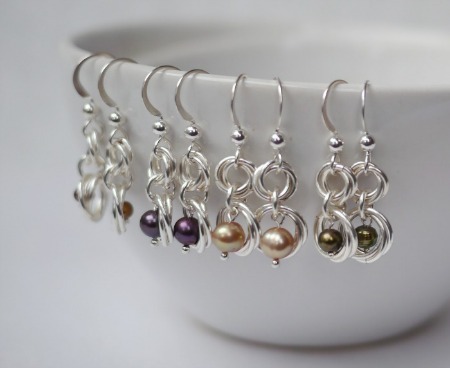 It is amazing to take a pile of jump rings and transform them into something wearable. Q: Any tips on selling handmade stuff? Be true to yourself and your style. I’ve had so many people tell me, “You should make this,” and while I appreciate the thought and know that they want to see my business thrive, my aim in my jewelry is not to please everyone and make something everyone is going to like, because that is never going to happen. Rather, I want to make things that I enjoy making and that are true to my style. Also, remember not to lose sight of why you are doing it. It can be easy to get caught up in the business-side of a handmade business, but you are doing this because you love creating and sharing your art. Q: Why should people buy handmade? A: Because it’s awesome! Seriously, though, I’m a huge proponent of supporting handmade businesses. You get to own something that is unique, interesting, and made with love (and perhaps some sweat and tears). Q: What advice would you give to artists who are new to Etsy? A: Check out the forums, read the Etsy blog, and join teams. Overall, I think Etsy is a very supportive community. There are so many wonderful tips and great mini-communities for whatever niche (or location) you are in. The Etsy blog in particularly was invaluable to me when I was first starting out. Q: Read any good books lately? A: I recently read The Firestarter Sessions by Danielle LaPorte. I guess you could call it a self-help book, which isn’t typically my thing, but I found it to be really inspiring and I like her style a lot (very no-nonsense). I’ve been reading a lot of nonfiction lately—at the moment I’m reading Season to Taste: How I lost My Sense of Smell and Found my Way by Molly Birnbaum, and I just finished reading Behind the Beautiful Forevers by Katherine Boo—mixed in with some fluffy chick lit (my guilty pleasure). Q: Is there anything about you that would surprise people to know? A: I’m the messiest organized person. I always know where things are (well, besides my car keys) but they are scattered all over my house. My friends are always surprised to find out I am messy. And my “studio” is basically my entire house. You will find beads, tools, jump rings, and tiny pieces of metal in my living room, my kitchen table, and my actual workspace. I just can’t be contained! To see more work by Bev Feldman of Linkouture visit: www.linkouture.etsy.com.